All of the items listed on her site are already made and ready to be shipped. However, if you have a special request, feel free to send her a message so the two of you can get to collaborating! 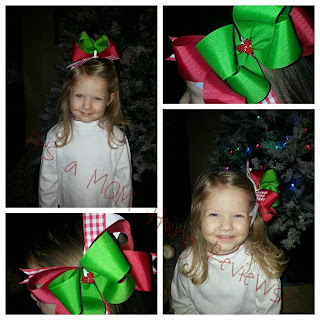 My daughters and I were selected to review a hair bow from SheWearsitWell! The bow we received is a green and red boutique stacked Christmas bow with holly berries in the center and a red/white plaid base. It looks quite ravishing on Jayde, if I do say so myself!